2013 Miami Marlins - MLB Baseball / NASCAR diecast, by Action. 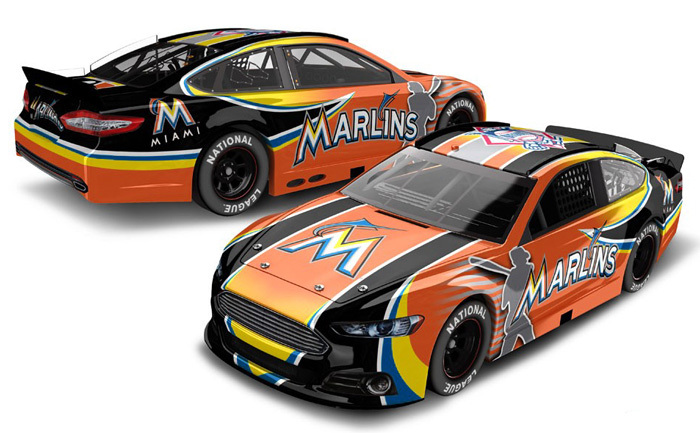 Miami Marlins Major League Baseball NASCAR diecast now available from Lionel Racing Collectables. Miami Marlins Inaugural Game at Marlins Park Framed and Matted Panoramic Photograph. This officially licensed MLB panorama photo is of the Miami Marlins Opening Day (Inaugural Game) at Marlins Park in Miami, Florida on April 4, 2012. The Miami Marlins played the St. Louis Cardinals. The deluxe panorama features black double matting and your choice of black or cherry frame, with a 1" x 4" engraved brass nameplate. Actual size is 40" x 14"
Miami Marlins Inaugural Game at Marlins Park Framed Panoramic Photograph. This officially licensed MLB panorama photo is of the Miami Marlins Opening Day (Inaugural Game) at Marlins Park in Miami, Florida on April 4, 2012. The Miami Marlins played the St. Louis Cardinals. The standard panorama features your choice of black or cherry wood frame. Actual size is 40" x 14"
Florida Marlins 1997 World Series Champions Framed and Matted Panoramic Photograph. This officially licensed MLB panorama photo is of Pro Player Stadium in Miami Gardens, during the 1997 World Series. The Florida Marlins defeated the Cleveland Indians 4 games to 3. The deluxe panorama features black double matting and your choice of black or cherry frame, with a 1" x 4" engraved brass nameplate. Actual size is 40" x 14"
Florida Marlins 1997 World Series Champions Framed Panoramic Photograph. This officially licensed MLB panorama photo is of Pro Player Stadium in Miami Gardens, during the 1997 World Series. The Florida Marlins defeated the Cleveland Indians 4 games to 3. The standard panorama features your choice of black or cherry wood frame. Actual size is 40" x 14"
Florida Marlins 1997 World Series Game 7 Framed and Matted Panoramic Photograph. This officially licensed MLB panorama photo is of Pro Player Stadium in Miami Gardens, Florida during (Game 7) of the 1997 World Series. The Florida Marlins defeated the Cleveland Indians in game 7 of the 1997 World Series. The deluxe panorama features black double matting and your choice of black or cherry frame, with a 1" x 4" engraved brass nameplate. Actual size is 40" x 14"
Florida Marlins 1997 World Series Game 7 Framed Panoramic Photograph. This officially licensed MLB panorama photo is of Pro Player Stadium in Miami Gardens, Florida during (Game 7) of the 1997 World Series. The Florida Marlins defeated the Cleveland Indians in game 7 of the 1997 World Series. The standard panorama features your choice of black or cherry wood frame. Actual size is 40" x 14"
Florida Marlins / Strike One at Joe Robbie Stadium Framed and Matted Panoramic Photograph. This officially licensed MLB panorama photo is of the Florida Marlins (Strike One) at Joe Robbie Stadium in Miami Gardens, Florida in a game during the 1993 season. The deluxe panorama features black double matting and your choice of black or cherry frame, with a 1" x 4" engraved brass nameplate. Actual size is 40" x 14"
Florida Marlins / Strike One at Joe Robbie Stadium Framed Panoramic Photograph. This officially licensed MLB panorama photo is of the Florida Marlins (Strike One) at Joe Robbie Stadium in Miami Gardens, Florida in a game during the 1993 season. The standard panorama features your choice of black or cherry wood frame. Actual size is 40" x 14"